Sun exposure causes skin cancer by damaging DNA. Clinical research demonstrates a tropical fern extract combined with nicotinamide prevents UV-induced skin damage and promotes DNA repair. This article describes how to markedly reduce solar-induced (UV) skin damage. It pertains to anyone who encounters daily sun exposure.The first section reveals how UV light damages cellular structures and why such injury accelerates skin aging.Some readers may find the beginning of this article technically challenging. This information, however, provides a basis to shield one’s skin from within against solar radiation. Sun exposure promotes formation of cancer-producing compounds that trigger DNA mutations.8-10Ultraviolet (UV) solar radiation stimulates formation of DNA photoproducts—such as cyclobutane pyrimidine dimers—that are highly mutagenic and DNA-altering.11UV-generated photoproducts alter a vital tumor-suppressor gene known as p53—“the guardian of the genome.”12-14The p53 gene activates DNA-repair and initiates apoptosis (cell death) if the DNA damage is irreparable.12,15P53 is one of the most frequently mutated genes in human cancers.12 Mutations in the p53 gene inhibit DNA repair by allowing damaged cells to escape apoptosis and propagate without undergoing normal DNA repair.16Telomeres are hypersensitive to UV damage.17 Undamaged p53 is essential for the destruction of damaged cells in response to shortened telomeres.18UVB-band radiation damages DNA by oxidizing it, producing reactive oxygen species (ROS).A major DNA-oxidation product is 8-hydroxy-2‘-deoxyguanosine, a marker for DNA damage.19 ROS damages dermal DNA, and these mutations in cell regulatory genes can trigger skin cancer.20Damaged DNA segments are normally removed by the body’s repair systems.21,22 This requires adequate adenosine triphosphate (ATP),21 which fuels cells’ intracellular machinery.UV radiation inhibits ATP production, which also decreases with age.8,23 Mutations allow cells that wouldn’t normally proliferate to evade normal cellular death and, instead, continue dividing.UV-induced DNA damage is the main cause of skin cancer, and UV radiation is also the main cause of skin photoaging.4Surprisingly, research shows that both visible sunlight and infrared light can trigger ROS production—indirectly damaging DNA.24Promoting prompt DNA repair effectively prevents malignant transformation in skin cells.25,26Researchers have identified compelling DNA-protective and DNA-repairing effects of orally-taken Polypodium leucotomos6,7 and of two other nutrients that enhance its effects. UV light radiation causes skin cancer by damaging DNA, while inhibiting the body’s normal DNA-repair mechanism. 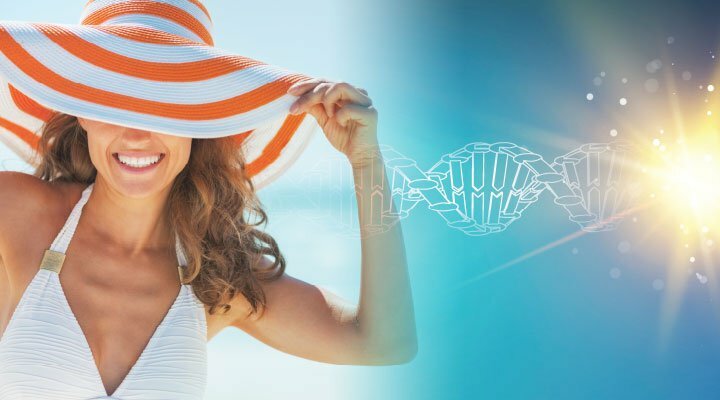 UV rays trigger mutations in the same gene that codes for the protein that activates DNA-repair proteins and eliminates those cells that cannot be repaired. Orally taken Polypodium leucotomos safely prevents DNA damage and restores DNA-repair capacity. A proprietary formulation combines this extract with two other nutrients that enhance DNA protection and deliver other UV defenses. This formulation protects against DNA damage from the inside out. For prolonged UV exposure, also use a topical sunscreen. Polypodium leucotomos is a tropical fern of the Polypodiaceae family, native to Central and South America. It was traditionally used there to treat psoriasis and other skin conditions.7,27This extract is rich in polyphenols that protect skin cells against UV, while inhibiting oxidative stress and inflammation.7Scientists found that Polypodium leucotomos, orally administered to hairless mice before UV radiation, inhibited DNA damage, activated p53, increased removal of cyclobutane pyrimidine dimers, and reduced the number of 8-hydroxy-2’-deoxyguanosine-positive (8-OH-dG+) cells, which are markers of early DNA damage.Not only were 8-OH-dG+ cells reduced 79% compared to controls after 24 hours—but 10 days of oral Polypodium leucotomos produced a 36% reduction compared to controls in these cells prior to UV exposure!6In this study, the Polypodium leucotomos-induced activation of a form of p53—phospho-p53 (Ser15)—correlated with decreased cyclooxygenase-2, an enzyme that promotes skin inflammation.6These findings suggest that Polypodium leucotomos helps prevent DNA damage before and during UV exposure.6In a clinical trial, healthy volunteers aged 29 to 54 took two 240-mg doses of Polypodium leucotomos extract orally, before UVA exposure. Skin biopsies revealed decreased levels of a marker of DNA damage.7 This suggests DNA-protective, and therefore, anticancer activity.In this study, a lower dose of UV light produced a 217% increase in common DNA deletions among placebo volunteers, while common deletions in the Polypodium-supplemented subjects showed an 84% decrease. 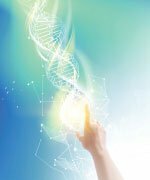 At a greater UV exposure, common deletions increased by 760% in placebo participants, while increasing only 61% in the Polypodium-supplemented group.7These data indicate that Polypodium leucotomos protects skin DNA by inhibiting the many mechanisms of UV light-induced skin-cell damage. UV radiation inhibits adenosine triphosphate (ATP) production, which also falls with age.8,23 But UV light also diminishes ATP levels and interferes with the body’s ability to remove damaged DNA portions to restore the normal DNA sequence.21,22As you’ll learn, one fundamental property of nicotinamide is that it boosts ATP.28For this and other reasons, nicotinamide and red orange extract have been incorporated into a proprietary Polypodium leucotomos formulation to supplement its potent DNA protection with additional defenses against ATP depletion and damaging UV radiation effects like inflammation and oxidative stress. Helps maintain Langerhans cells, immune skin-cells that scavenge toxins and debris. The risk of dying from the most deadly of skin cancers—melanoma—is directly related to its depth.38 This, in turn, is directly related to how long the melanoma has been growing without being noticed.Despite this, in 2009, the United States Preventive Services Task Force (USPSTF) found “no new evidence on the effectiveness of either skin examination by a physician or skin self-examination (SSE) in reducing…skin cancer.”39Then, in 2016, the task force concluded that, “current evidence is insufficient to assess…visual skin examination by a clinician to screen for skin cancer.”40 Potential harms cited included the risk of “cosmetic effects” from unnecessary biopsies.40The task force believes it’s better to risk skin cancers than to risk skin scarring.Life Extension® has long disagreed with the USPSTF’s position. We’re in good company.The American Academy of Dermatology promotes professional skin examinations in its Skin Cancer Screening Program.41Numerous scientists agree.42-48 Research shows that up to 57% of newly diagnosed melanoma patients could detect their own melanomas by skin self-examination.43Whole-body, professional skin examinations lower risk of being diagnosed with thick (deadlier) melanoma.44Physicians can more easily detect melanomas at a thinner stage compared with self-examinations.45-48Oral Polypodium leucotomos—buttressed by topical sunscreen—represents the first line of defense against DNA damage and skin cancer. The last line of defense, despite the USPSTF’s position, is regular skin examinations by both the individual and a qualified skin specialist. 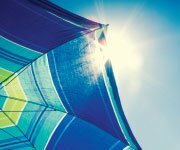 Acting through several mechanisms, UV radiation causes over 90% of non-melanoma skin cancers by inducing damage to DNA—and more critically, by inhibiting the body’s natural DNA-repair capacity.Clinical research demonstrates that, taken orally prior to sun exposure, Polypodium leucotomos prevents DNA damage and promotes DNA repair. Two other nutrients have been shown to enhance this DNA protection and deliver other UV defenses. All three ingredients can now be found in a single proprietary formulation.If you spend even brief periods outside daily, this oral formulation can help protect against DNA damage—and skin cancer—from the inside. 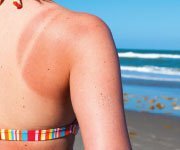 For prolonged exposure to UV radiation however, this potent defense should be supplemented with a high-quality topical sunscreen for more complete protection.If you have any questions on the scientific content of this article, please call a Life Extension® Wellness Specialist at 1-866-864-3027. Syrigos KN, Tzannou I, Katirtzoglou N, et al. Skin cancer in the elderly. In Vivo. 2005;19(3):643-52. Kim I, He Y-Y. Ultraviolet radiation-induced non-melanoma skin cancer: Regulation of DNA damage repair and inflammation. Genes & Diseases. 2014;1(2):188-98. Hussein MR. Ultraviolet radiation and skin cancer: molecular mechanisms. J Cutan Pathol. 2005;32(3):191-205. Nishigori C. Cellular aspects of photocarcinogenesis. Photochem Photobiol Sci. 2006;5(2):208-14.
de Gruijl FR, van Kranen HJ, Mullenders LH. UV-induced DNA damage, repair, mutations and oncogenic pathways in skin cancer. J Photochem Photobiol B. 2001;63(1-3):19-27. Zattra E, Coleman C, Arad S, et al. Polypodium leucotomos extract decreases UV-induced Cox-2 expression and inflammation, enhances DNA repair, and decreases mutagenesis in hairless mice. Am J Pathol. 2009;175(5):1952-61. Villa A, Viera MH, Amini S, et al. Decrease of ultraviolet A light-induced “common deletion” in healthy volunteers after oral Polypodium leucotomos extract supplement in a randomized clinical trial. J Am Acad Dermatol. 2010;62(3):511-3. Chen AC, Halliday GM, Damian DL. Non-melanoma skin cancer: carcinogenesis and chemoprevention. Pathology. 2013;45(3):331-41. Pfeifer GP, You YH, Besaratinia A. Mutations induced by ultraviolet light. Mutat Res. 2005;571(1-2):19-31. Sage E, Girard PM, Francesconi S. Unravelling UVA-induced mutagenesis. Photochem Photobiol Sci.2012;11(1):74-80. Kim SI, Jin SG, Pfeifer GP. Formation of cyclobutane pyrimidine dimers at dipyrimidines containing 5-hydroxymethylcytosine. Photochem Photobiol Sci. 2013;12(8):1409-15. Anna B, Blazej Z, Jacqueline G, et al. Mechanism of UV-related carcinogenesis and its contribution to nevi/melanoma. Expert Rev Dermatol. 2007;2(4):451-69. Lane DP. Cancer. p53, guardian of the genome. Nature. 1992;358(6381):15-6. Available at: https://ghr.nlm.nih.gov/gene/TP53. Accessed March 10, 2017. Tornaletti S, Pfeifer GP. Slow repair of pyrimidine dimers at p53 mutation hotspots in skin cancer. Science.1994;263(5152):1436-8. Ha G-H, Breuer E-KY. Mitotic Kinases and p53 Signaling. Biochemistry Research International.2012;2012:14. Shim G, Ricoul M, Hempel WM, et al. Crosstalk between telomere maintenance and radiation effects: A key player in the process of radiation-induced carcinogenesis. Mutation Research/Reviews in Mutation Research. 2014;760:1-17. Artandi SE, Attardi LD. Pathways connecting telomeres and p53 in senescence, apoptosis, and cancer. Biochem Biophys Res Commun. 2005;331(3):881-90. Hattori Y, Nishigori C, Tanaka T, et al. 8-hydroxy-2’-deoxyguanosine is increased in epidermal cells of hairless mice after chronic ultraviolet B exposure. J Invest Dermatol. 1996;107(5):733-7. Emanuel P, Scheinfeld N. A review of DNA repair and possible DNA-repair adjuvants and selected natural anti-oxidants. Dermatol Online J. 2007;13(3):10. Boiteux S, Jinks-Robertson S. DNA repair mechanisms and the bypass of DNA damage in Saccharomyces cerevisiae. Genetics. 2013;193(4):1025-64. Rastogi RP, Richa, Kumar A, et al. Molecular mechanisms of ultraviolet radiation-induced DNA damage and repair. J Nucleic Acids. 2010;2010:592980. Park J, Halliday GM, Surjana D, et al. Nicotinamide prevents ultraviolet radiation-induced cellular energy loss. Photochem Photobiol. 2010;86(4):942-8. Lohan SB, Muller R, Albrecht S, et al. Free radicals induced by sunlight in different spectral regions – in vivo versus ex vivo study. Exp Dermatol. 2016;25(5):380-5. Kabir Y, Seidel R, McKnight B, et al. DNA repair enzymes: an important role in skin cancer prevention and reversal of photodamage–a review of the literature. J Drugs Dermatol. 2015;14(3):297-303. Katiyar SK. Green tea prevents non-melanoma skin cancer by enhancing DNA repair. Arch Biochem Biophys. 2011;508(2):152-8. Choudhry SZ, Bhatia N, Ceilley R, et al. Role of oral Polypodium leucotomos extract in dermatologic diseases: a review of the literature. J Drugs Dermatol. 2014;13(2):148-53. Surjana D, Halliday GM, Damian DL. Nicotinamide enhances repair of ultraviolet radiation-induced DNA damage in human keratinocytes and ex vivo skin. Carcinogenesis. 2013;34(5):1144-9. Thompson BC, Surjana D, Halliday GM, et al. Nicotinamide enhances repair of ultraviolet radiation-induced DNA damage in primary melanocytes. Exp Dermatol. 2014;23(7):509-11. Yiasemides E, Sivapirabu G, Halliday GM, et al. Oral nicotinamide protects against ultraviolet radiation-induced immunosuppression in humans. Carcinogenesis. 2009;30(1):101-5. Chen AC, Martin AJ, Choy B, et al. A phase 3 randomized trial of nicotinamide for skin-cancer chemoprevention. N Engl J Med. 2015;373(17):1618-26. Cardile V, Frasca G, Rizza L, et al. Antiinflammatory effects of a red orange extract in human keratinocytes treated with interferon-gamma and histamine. Phytother Res. 2010;24(3):414-8. Cimino F, Cristani M, Saija A, et al. Protective effects of a red orange extract on UVB-induced damage in human keratinocytes. Biofactors. 2007;30(2):129-38. Frasca G, Panico AM, Bonina F, et al. Involvement of inducible nitric oxide synthase and cyclooxygenase-2 in the anti-inflammatory effects of a red orange extract in human chondrocytes. Nat Prod Res.2010;24(15):1469-80. Saija A, Tomaino A, Lo Cascio R, et al. In vitro antioxidant activity and in vivo photoprotective effect of a red orange extract. Int J Cosmet Sci. 1998;20(6):331-42. Bonina F, Puglia C. Effect of the supplementation with Red Orange Complex® on ultraviolet-induced skin damage in human volunteers. Italy: BIONAP Report. Calzavara-Pinton P, Ortel B, Venturini M. Non-melanoma skin cancer, sun exposure and sun protection. G Ital Dermatol Venereol. 2015;150(4):369-78. Available at: http://www.skincancer.org/skin-cancer-information/melanoma/melanoma-prevention-guidelines/melanoma-screening-saves-lives. Accessed March 22, 2017. Available at: https://www.ncbi.nlm.nih.gov/books/NBK34051/pdf/Bookshelf_NBK34051.pdf. Accessed March 15, 2017. Bibbins-Domingo K, Grossman DC, Curry SJ, et al. Screening for Skin Cancer: US Preventive Services Task Force Recommendation Statement. Jama. 2016;316(4):429-35. Available at: https://www.aad.org/public/spot-skin-cancer/programs/screenings/what-to-expect-at-a-screening. Accessed March 15, 2017. Schneider JS, Moore DH, 2nd, Mendelsohn ML. Screening program reduced melanoma mortality at the Lawrence Livermore National Laboratory, 1984 to 1996. J Am Acad Dermatol. 2008;58(5):741-9. Brady MS, Oliveria SA, Christos PJ, et al. Patterns of detection in patients with cutaneous melanoma. Cancer. 2000;89(2):342-7. Aitken JF, Elwood M, Baade PD, et al. Clinical whole-body skin examination reduces the incidence of thick melanomas. Int J Cancer. 2010;126(2):450-8. Carli P, De Giorgi V, Palli D, et al. 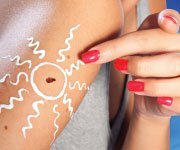 Dermatologist detection and skin self-examination are associated with thinner melanomas: results from a survey of the Italian Multidisciplinary Group on Melanoma. Arch Dermatol. 2003;139(5):607-12. Carli P, De Giorgi V, Palli D, et al. Self-detected cutaneous melanomas in Italian patients. Clin Exp Dermatol.2004;29(6):593-6. Epstein DS, Lange JR, Gruber SB, et al. Is physician detection associated with thinner melanomas? Jama.1999;281(7):640-3. Swetter SM, Johnson TM, Miller DR, et al. Melanoma in middle-aged and older men: a multi-institutional survey study of factors related to tumor thickness. Arch Dermatol. 2009;145(4):397-404.